Hey everyone! It's June! 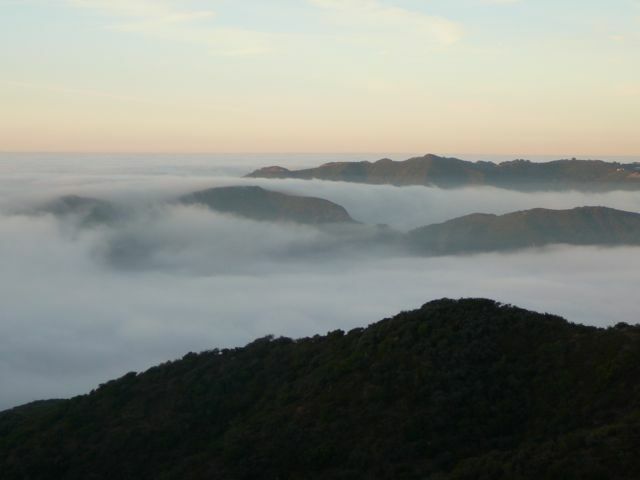 You know what that means: time to celebrate JUNE GLOOM! June Gloom is the terms used locally to describe the thick coastal fog that Los Angeles and much of coastal Southern California experiences in the Spring and early summer months. When we lived in Los Angeles, hiking locally in the Santa Monica Mountains was one way to actually enjoy June Gloom. A very accessible trail is the Temescal Ridge trail, part of Topanga State Park. 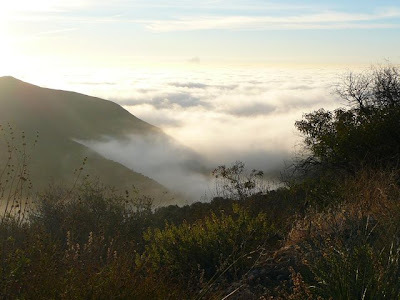 The trailhead is located at the top of the Palisades Highlands in Pacific Palisades. 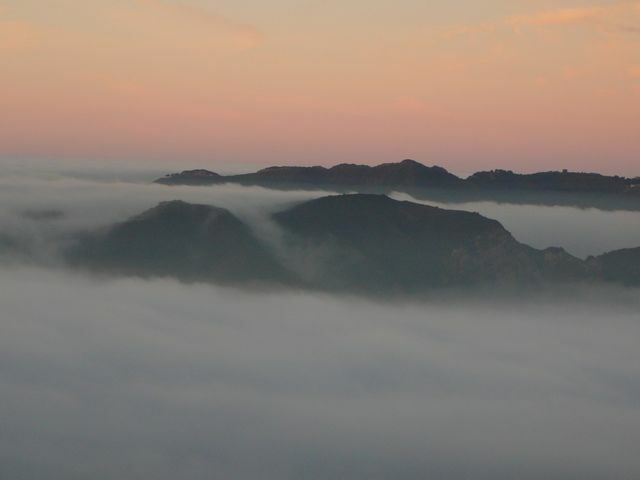 Homes, mountains, fog: the photo above is looking east with Topanga Canyon in the distance. 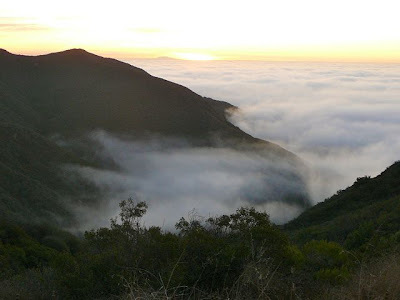 The trailhead is a few steps away from this spot. I've blogged about this trail several times before - each time it's different. 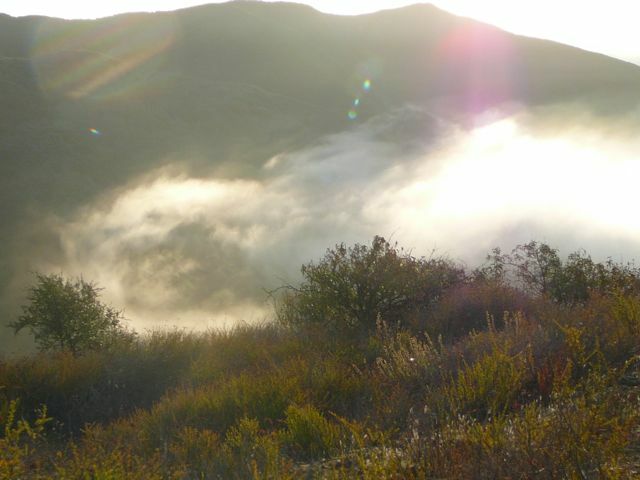 Heading north along the trail, the fog was literally pouring over the adjacent ridges. It was amazing to watch. 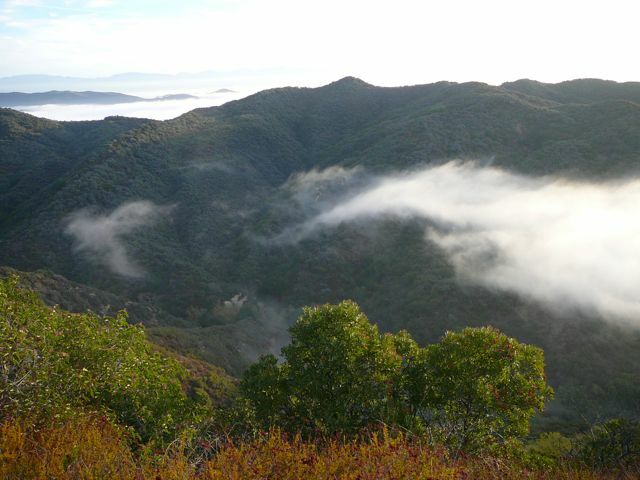 Above is the top of the Paseo Miramar ridge trail. Here's a link to some similar sunrise photos, taken a couple of years ago from the Paseo Miramar trail. 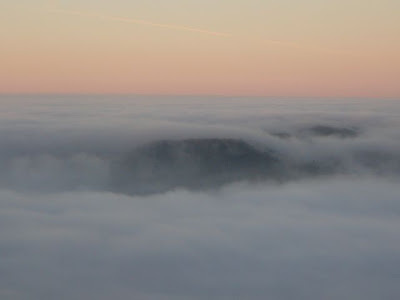 In a matter of minutes the entire ridge was engulfed in a thick blanket of fog. 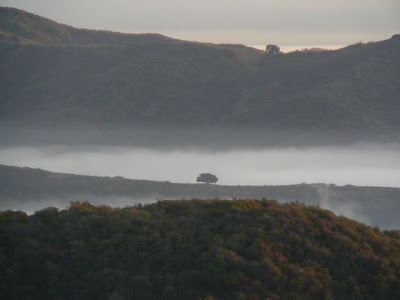 The fog allowed for some interesting photos, including the large tree several miles to the east on the western ridge of Mandeville Canyon. Normally, this tree would be completely blended in to the rest of the terrain: it's visible only because of the contrasting white fog. Same tree - gives you an idea how far away it was. These mountains, the Santa Monicas, run from Griffith Park in the east all the way to Point Mugu in the west. They literally cut through the City of Los Angeles, separating the San Fernando Valley from the rest of the city. 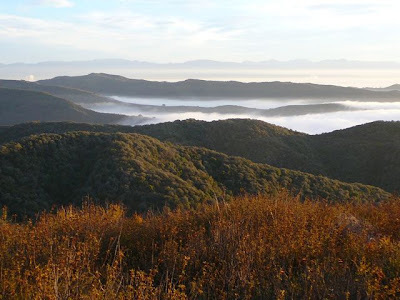 With the exception of the San Garbriel Mountains (barely visible in the distance), everything else you're looking at lies within the city limits of Los Angeles. Another view, same tree (or trees), with the fog morning for some interesting patterns. I've commented previously that the coastal fog is a continual reminder of how brief and temporal our own lives are. Seventy, or - if we're lucky - eighty, years is a blink in light of eternity. As a Christian, I've found that the creation - in all it's beauty, complexity, and design - points to a Creator. And, yes, I realize this perspective isn't limited to Christianity. 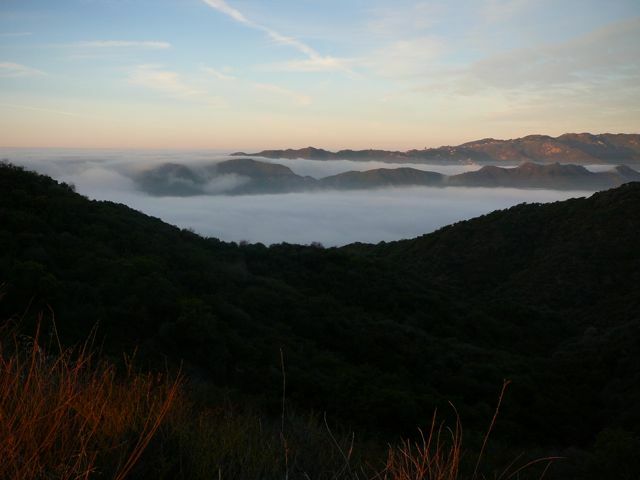 Looking back east towards Topanga Canyon. The ridge that was covered in fog a few minutes earlier was once again visible. 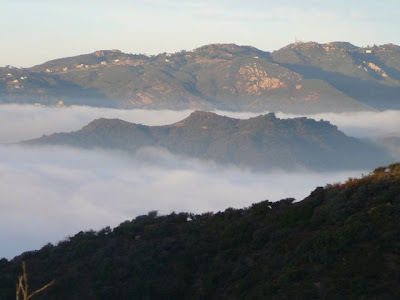 Another view: the homes along the ridge on on the western edge of Topanga Canyon. 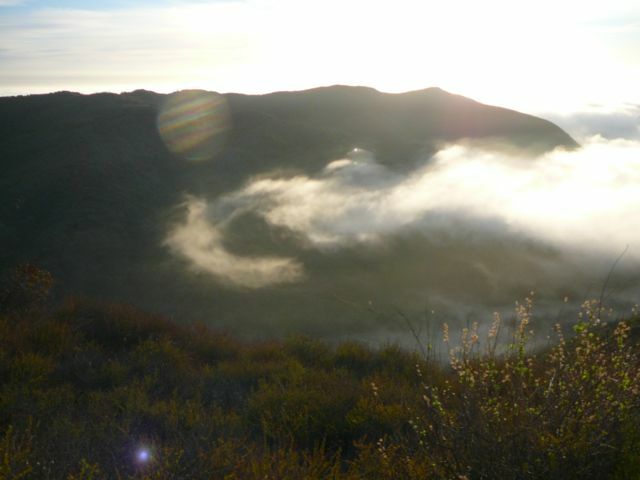 Looking into upper Temescal Canyon as the fog made it's way up the canyon . . .
. . . making for some interesting patterns. 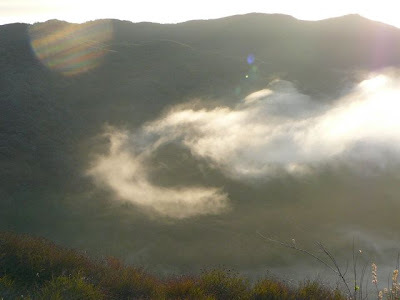 Swirling around, looking almost like a dragon . . .
. . . or a hook . . .
. . . and a minute later, it was gone. 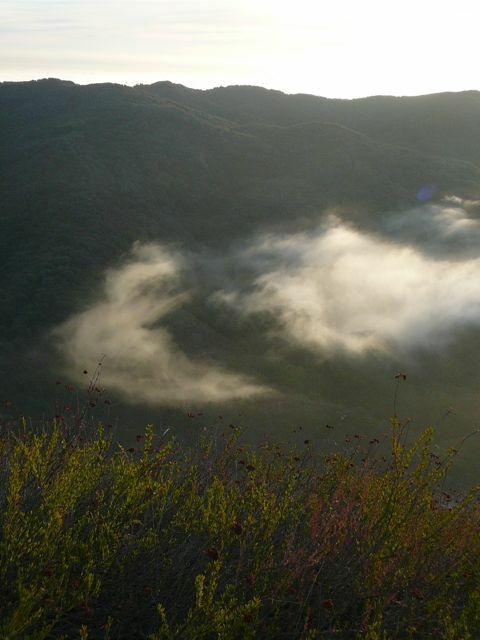 A few last wisps of fog in the upper-most reaches of Temescal Canyon. Thinking a bit more about our brief stint on earth, French mathematician, physicist and philosopher Blaise Pascal comes to mind. Pascal - who only lived to age 39 - used logic and mathematics to argue for the existence of God in what's commonly known as "Pascal's Wager." 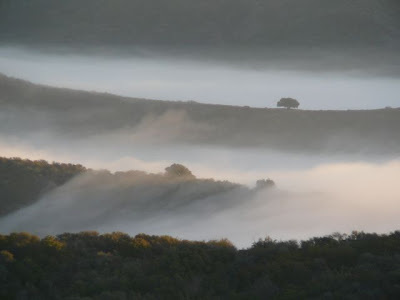 A UCLA professor summarized Pascal's Wager on her website: "If God does not exist, one will lose nothing by believing in him, while if he does exist, one will lose everything by not believing." Or, the bumper sticker sticker version: "If you live as if there is no God, you better be right." While mathematics was probably my weakest subject in college, Pascal's Wager certainly makes a strong argument to at least consider the implications of Christianity. 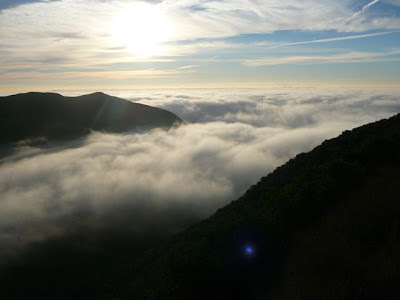 And hiking along Temescal Ridge, I found the beauty of what I was experiencing an equally compelling argument to consider if there is something more than our seventy or so years on earth. A final photo with the same fog now creeping up towards the top of the Palisades Highlands. A few minutes later I was in my car, having gotten some exercise, nice photos, and - thanks to Pascal and the local weather patterns - something significant to reflect on. 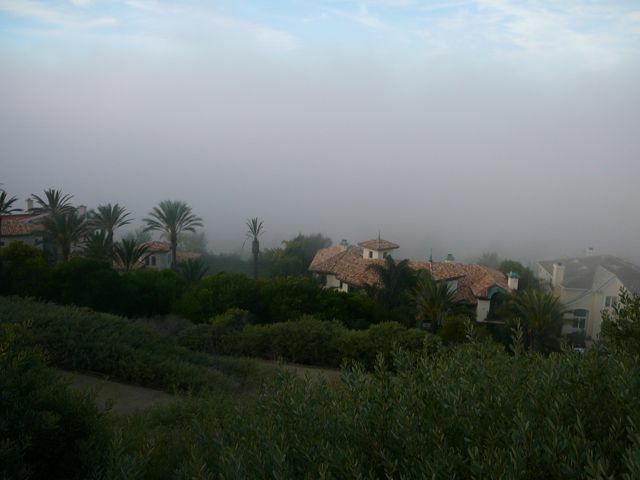 The trailhead, located just past the corner of Via Las Palmas and Via La Costa in Pacific Palisades. 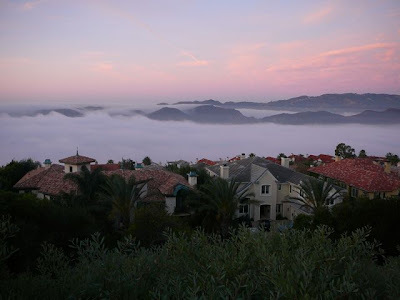 While Via Las Palmas might look like a gated community, it is most assuredly a public road. Continue another 100 yards on Via Las Palmas past Via La Costa, and there is a public parking lot (with restrooms) on the left. A friend from Michigan (who has never been to Cali) asked "is that smog"? - ha! I had to explain to her that, no, it's coastal fog. Guess they don't have mountains in Michigan.